Panasonic TX-L32V10 review | What Hi-Fi? Panasonic is having a strange time with its TVs. Having previously been a consistently high performer, recent sets have tended to be good, rather than excellent. Sadly this set continues the trend. We're a bit puzzled as to why the TX-L32V10 is so expensive. The main justification here for the £950 price-tag is the built-in Freesat tuner. There's also access to Panasonic's Viera Cast technology for online content, but as Sony's £600 KDL-32V5500 includes the comparable Applicast feature, this Panasonic still seems pricey. 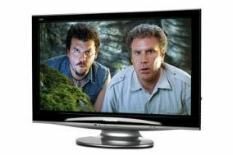 Specification-wise, there are Freesat, Freeview and analogue tuners, a 1920 x 1080 Full HD resolution, 100Hz intelligent frame creation, Viera Cast, Viera Link and a trusty SD card input. The Freesat tuner looks great with HD and SD channels have a rich palette with smooth motion. It pips the Freeview tuner for picture performance but edges could be sharper and images a bit cleaner compared to the best tuners. Audio is fine, though again we've heard clearer, more detailed sounding sets elsewhere. Watching Old Boy on Blu-ray, colours are full-bodied but it lacks a little solidity and realism, while black levels have a bluish tint. This isn't a bad TV but it is an expensive one, and we don't see how the Panasonic does enough to justify the price – even if you do value that Freesat tuner.